I hope you are enjoying your weekend; and though I know things are winding down, there are still some bargains to be had. Check out this blog post to find some amazing deals, like bundles for a super low price, and coupon codes for even further discounts off the already low, 50% store-wide sale. As if that’s not enough, you have an opportunity to enter to win three give-away packages. So be sure to click the link and enter to win while snagging some quality product at a great price! I’d like to show you a few layouts using SnickerdoodleDesigns’ product which may help you choose what you would like to add to your stash. I love the clean look of Morning Coffee by bekfek. She used the Rise and Shine Collection to create her layout. The blended background,which is included in the collection, is the perfect foundation for her layout. No need to extract the cup, as it’s also included. I really like the way she documented an everyday moment. The photo is lovely for a candid and the clustering behind is perfectly shadowed. The sprinkling of coffee beans adds interest and the right-justified journaling and awesome title work finish things off just right. 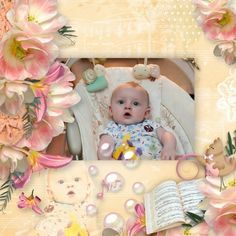 Sunshine by kabrak1207, features a delightful photo of her granddaughter. She used You Are My Sunshine Collection. She also incorporated the free mini kit created by Snickerdoodle Designs and offered at TDC as part of the Use It All Challenge. It’s such a happy photo and the mood of the layout reflects that accordingly. I love the framing, and large, shadowed clusters. Using the journal card to ground the word art, both included in the free mini, is the perfect added touch. Autumn Smiles by dj_w definitely makes me smile. She used Painted Autumn Collection and a template by Akizo Designs. I really like the soft colors of her layout which perfectly match the photos. The repeating circles both shadowed and cut-out, make for an interesting design. The stacked papers, scattered embellishments, as well as the larger cluster on the left hand side, all add up to a well-executed page. The word art she chose to replace her title and journaling supports her theme just right. Here’s another inspiring layout, Love to Fetch by Glori2. 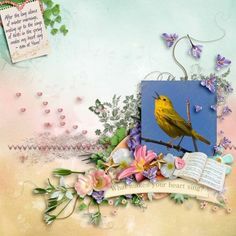 She used Garden Gate Collection and a template by Heartstrings Scrap Art. I love the masking on the large photo with the smaller framed photos placed on top. The photo series really tells a story. The clustering around the edges of the page is so pretty and blends seamlessly with her photos. Such cute title work too. There’s not much time left to finish up your shopping so I hope I have helped you narrow down your choices. Of course, at these bargain prices you can afford to buy even more. 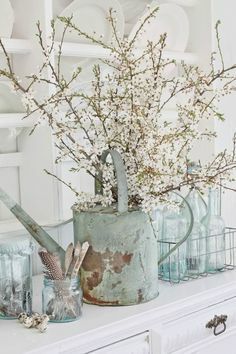 Have fun scrapping with all your new goodies and have a great week.